Exeter is a wonderful place and being here has allowed me to experience some truly wonderful things. Here are a few must do things at Exeter, some of which have been novel experiences for me! Try a traditional Devonshire Cream tea. These are the absolute best and will totally change your perception of tea! Just a heads up, a cream tea means having tea with a scrumptious scone slathered with clotted cream and jam. I didn’t realise this until I tried it! Walk along the Quayside – Exeter’s historical quayside is a sight to behold. Be it for a refreshing walk, a quick run or a picnic, the quayside is perfect to spend some some quality time on. 3. 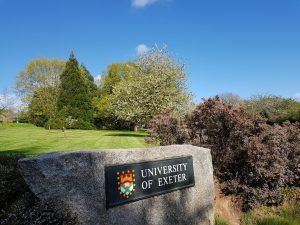 Explore campus and take a photo with the University of Exeter stone – A must do for everyone, especially students. The campuses have some hidden gems and exploring the campus always leads to new discoveries. Of course, its always a joy to stumble upon a cute little pond with lots of bunnies frolicking in the shades of the trees! It is practically a ritual to take lots of photos with the Exeter stone. Visit Exeter Cathedral – The Cathedral is majestic to look at and even more gorgeous inside. Apart from the peaceful feeling it inspires, it’s also a delight to look at. Don’t forget to walk around the Cathedral Green and check out the eclectic shops around there. I promise you won’t be disappointed! Take the train to Exmouth Beach – Fun times at the beach and exhilarating cliff-side walks are barely a half hour train ride away! Exmouth beach offers a fun day out at a very affordable cost. Visit Exeter’s museum – The Royal Albert Memorial Museum is free to visit. The museum houses everything from pre-historic fossils to mummies, relics from ancient cultures and animal specimens. It’s fun to explore and offers a stunning view of the old Roman walls from a viewing area near the top. 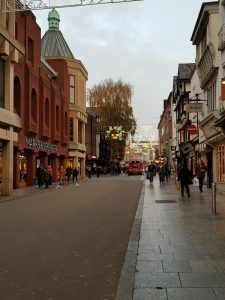 Go for a shop in Princesshay or just stroll along High Street – In the heart of Exeter, the High Street is always a buzz of activity. There are decorations on the street, the sound of live music intermingling with the sounds of people and the delicious smells wafting from all the bakeries and restaurants around! It’s always a delightful experience and the amazing (sometimes hidden) shops all along the High Street and the alleys leading from it ensure that you’ll never return empty-handed! Yummy pizza at the Firehouse! Walk along the Roman wall – One of the biggest landmarks in Exeter’s history, this wall has been standing for centuries. Located near Princesshay, take a walk along the Roman wall and enjoy some more historic sights of Exeter. 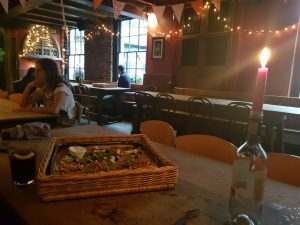 Get some delicious (and affordable) pizza at the Firehouse – A fun place to hang out with friends at the end of the day, this pub is definitely a must visit. While it’s calmer earlier in the evening, it gets busier and more lively towards the end of the night. Its main attraction is definitely the amazing pizzas it sells! 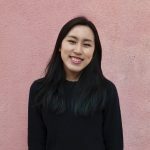 Take a self-guided walking tour – The city council offer several leaflets with different types of self-guided walking tours, be it a Medieval Trails or the Exeter Woollen Trail. More information about the trails can be found on the website. Check out the Ram Bar – The Ram bar on the Streatham Campus is a great place to unwind and relax. Grab a drink with some friends and enjoy good food with good company! 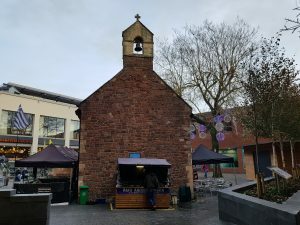 Visit the Exeter Underground Tunnels – If you’re fond of thrills, visit the Exeter Underground Tunnels near Princesshay for a tour exploring under Exeter streets and learning more about the city’s old water supply. Visit the Bill Douglas Cinema Museum on campus. This amazing museum is located next to the Old Library. You’ll know everything there is to know about films and best of all, it is completely free to visit! Get all your essentials – Food, kitchen utensils, toiletries and more are conveniently in the Guildhall shopping centre. You can get everything you ever needed (or wanted) in town. From food to clothes to books, there’s everything available here. As a bonus, the old St. Pancras Church is still present there and always worth a quick look.